When GREY2K USA was formed a decade ago its founders, including myself, had just suffered a heartbreaking defeat in our home state of Massachusetts. Despite our best efforts, a November 2000 ballot question to end greyhound racing had been defeated by the narrowest of margins, 51% to 49%. Despite this setback, we were committed to moving forward and fighting for greyhounds. We also believed in the need for a global view, and wanted to help greyhounds in other states and countries. It would have been easy to only care about the greyhounds in our community, but we knew that was a shortsighted view. To start with, the dogs in our community were not more worthy of our efforts than greyhounds elsewhere. Further, having a global view was particularly important because the greyhound racing industry is not a local industry. In the United States, for example, racing dogs will often be born in one part of the country, shipped to several states to race, and then end up being adopted out or discarded in yet another part of the country. Also, the greyhound racing industry is increasingly becoming a global entity. Because this cruel industry is multinational, a multinational solution is called for. That is why I am so proud to support the efforts of groups like Greytexploitations. Based in Britain, this all-volunteer organization is leading the way for greyhounds in the United Kingdom and has already won many important victories. 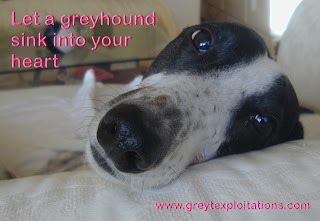 This morning, Greytexploitations launched a new campaign to prevent the return of dog racing at Walthamstow Stadium, and needs your help. The Stow, as it was more commonly known, was an iconic racetrack in East London that closed in August 2008. 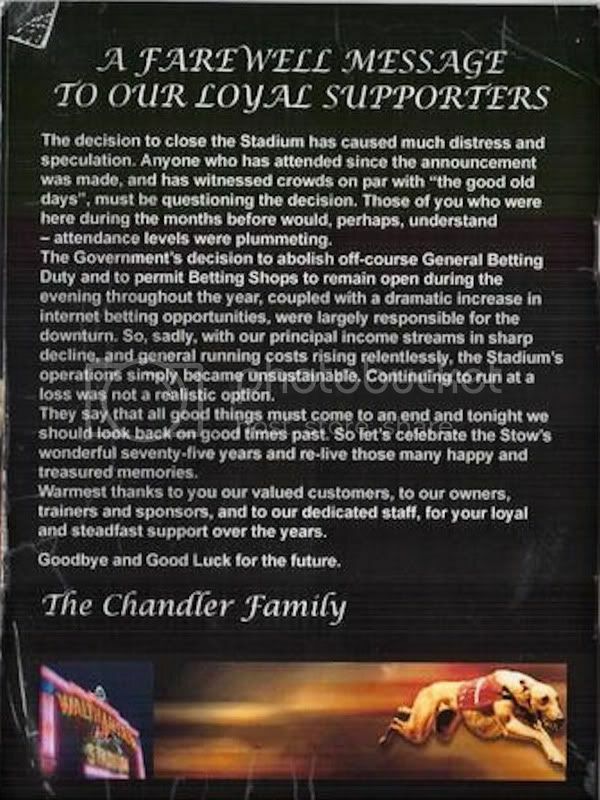 When greyhound racing ended at the Stow, it's owners cited falling attendance and said that dog racing "simply became unsustainable." The land was then purchased by an association named London and Quadrant, which specializes in quality, affordable housing. L&Q has submitted plans to develop the site, and those plans are being considered now. Unfortunately, greyhound breeders have not given up on the Stow, and are pushing for greyhound racing to return. They have tried to force L&Q to sell the property to a dog track owner named Bob Morton, at a price that is far below market value. Their reckless campaign has been helped by a few local politicians, including Member of Parliament Stella Creasy. These politicians are resorting to the worst kind of political opportunism, putting the interests of a handful of greyhound breeders ahead of the interests of the community as a whole. Most importantly, if this dangerous campaign succeeds, greyhounds will pay a heavy price. This morning, Greytexploitations released powerful video footage taken at Walthamstow before the track closed. Please watch this footage, and forward it to everyone you know. If you are on Facebook, join and "like" the new Facebook support group for the Say No to the Stow Campaign. Submit a comment to the Waltham Forest Planning Explorer in favor of L&Q's plan to build affordable housing at the site of Walthamstow Stadium. Send e-mails to the local officials who represent Walthamstow, asking them to oppose the reintroduction of greyhound racing. To find the e-mails of these local officials, visit Greytexploitation's website. Together, we can make sure that no greyhound ever suffers at Walthamstow Stadium again. That would be a victory for greyhounds everywhere.